Over the weekend and into Monday, rumours of potential interest from German giants Hamburg has developed into confirmed interest in Everton’s Nikica Jelavic. Jelavic is a classic case of second season syndrome. After bursting onto the scene in the second half of the 2011/12 season, Jelavic struggled to recapture the same form of his first full season at the club, scoring only 7 league goals in 37 appearances, compared with 9 in 13 the previous year. There are many theories put forward for the decline in form of the Croatian hitman, but for me, the way he was treated and portrayed by David Moyes was the biggest factor behind his drop in form. It was in the early stages of last season when David Moyes criticised the form of Jelavic, deciding to go public with concerns over the former Rangers strikers’ sharpness in front of goal. Bizarrely, Jelavic has just struck the winning goal against Sunderland to take his goal tally for the season to 5 from 10 Premier League games, a not too shabby return by anyone’s standards. Speaking to evertontv after the match Moyes raised concerns over the form of his centre forward; an extract of the article is included below. Moyes was also buoyed to see striker Jelavic end a three-game hunt for a goal after admitting the former Rangers man was out of form following last weekend’s 2-2 draw at Fulham. Those comments sparked a run of just 1 goal in the next 19 Premier League matches with Jelavic clearly suffering a crisis of confidence following a very public dressing down from his manager. I am not one for criticising a manager and I am sure David Moyes thought long and hard before making those comments to the media, but on this occasion he failed to recognise the delicate psyche of one of his key players. 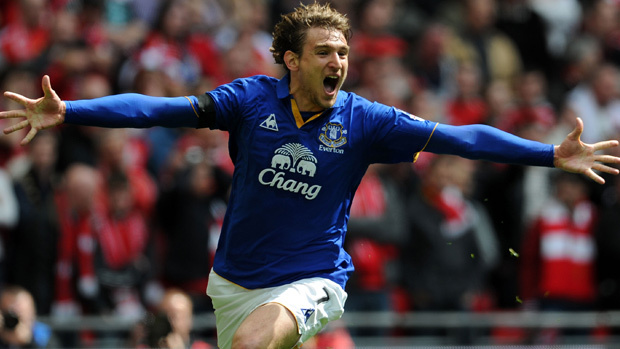 Nikica Jelavic is a talented goalscorer and players with such a natural instinct in front of goal are in short supply. His record since move to Britain has been phenomenal, 30 goals in 45 league appearances for Rangers and then 16 in 50 for the Toffees, 9 of those goals coming in the first 13 league appearances for the Blues. It is hard to disagree with those who say he has looked far from a natural goalscorer in the last 20 matches, but many of the world’s best strikers have endured a baron spell, when short of confidence. At £6 million his value is as low as it will realistically fall and at that price, Everton will struggle to sign a striker of equal ability. Under Martinez Everton’s tactical approach will be significantly different, with Jelavic, Kone and Anichebe battling for the central striking birth in a progressive forward line, accompanied by quick paced and direct wingers. Selling Jelavic now would be a huge mistake and unless Hamburg significantly raise the stakes, Everton should do all they can to keep the Croatian at Goodison next season. Jelavic missed plenty of sitters last season. His so called ‘natural goalscoring’ ability is a lie. He’s a Championship player and RM would be wise to bite the hand off anyone silly enough to pay money for Jelavic. Agreed. In a team playing football good chances in the box Jelavic could be a 20 goal striker. Felli moved further upfront, and Evertons style of play changed,the wide players where not putting the ball into the box ,it was being held up on the chest of Felli his form went downhill, and he seemed to be loggerheads with Mirallas,i think the goals will come again,with the style of play that Marty will bring to the club. Totally agree with every word …… Keep him. The first season everything went for him. Last season nothing went for him. Somewhere in the middle is an average championship level striker who is currently adding to our wage bill and should be off loaded asap imo. Yeah – I agree with the writer. It would be wrong to sell the Jellyman before Bobby’s had a chance to work with him and see how he fits into our new system and style. I think he could thrive. He was dynamite when he first came to the club and hasn’t suddenly become a poor striker. Yes… he was frustrating to watch last season, as his touch and finishing deserted him for some reason. But too often, he was drifting around and left to do a lot of the grunt work by himself. I think he missed having Timmy Cahill up there with him to win battles and open up space. He’s the kind of guy who needs to be in the box and fed, as he’s proved that he’s a killer one-touch finisher. The winner vs. Spurs last season is a good example (and the reaction of his team-mates showed how well-liked he is). He needs to regain his confidence and I hope we give him another chance.